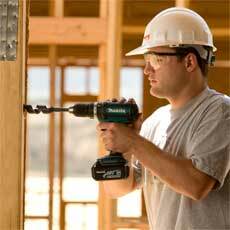 Variable 2-speed 1/2"" Hammer Driver-Drill (0-400 & 0-1,500 RPM) with Makita-built 4-pole motor delivers 480 in.lbs. of Max Torque and weighs only 4.0 lbs. 6-1/2"" Circular Saw delivers 3,700 RPM for faster cutting and ripping through wood and weighs only 7.3 lbs. Reciprocating Saw provides 0-2,900 SPM with ""tool-less"" blade changes & shoe adjustments and weighs only 7.9 lbs. Variable speed Impact Driver (0-2,300 RPM & 0-3,200 IPM) provides 1,420 in.lbs. of Max Torque and weighs only 3.3 lbs. 4-1/2"" Cut-Off/Angle Grinder produces an impressive 10,000 RPM and weighs only 5.0 lbs.